They may not meet established criteria for access to specific services (e.g. housing, social welfare, health care, etc). Their immigration status or understanding of their residency-related rights may not be clear. They may be ineligible for free or subsidized services (due to records of family income being higher than the maximum amount), but unable to pay directly for services on their own. They may have had a negative relationship with the service provider due to previous interactions. They may be afraid to make the call to seek help (Dozois, 2007; Bennett, et. al., 2004; Thelen, 2000). Through participation in coordinated community responses, shelters can inform and advocate with systems representatives for responses that address the needs of victims. Shelters play an important, even central role in systems coordination for women escaping situations of violence. Effectively supporting and advocating for women within the shelter context involves assisting them to access their rights and receive appropriate services from various institutions. Shelters typically engage the full spectrum of related systems for women including health, legal, financial, housing, education, child-related and social services. 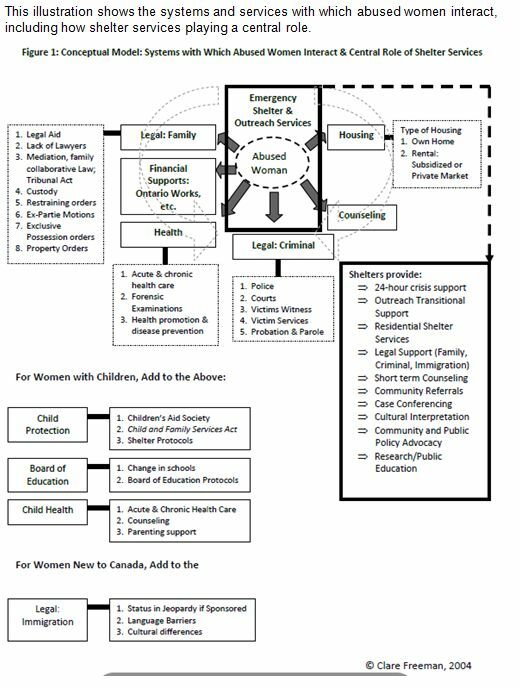 Systems advocacy evolved out of individual advocacy practices in which advocates supported women to manoeuvre various social, community, legal policing, judicial and health services. Over time, individual advocacy efforts have drawn attention to the systemic obstacles for women victims of violence, which has resulted in the increased attention to coordinating community responses and systems advocacy (Thelen, 2000). Exemptions and waivers to work requirements for abused women, when applying for social assistance programmes. Collaboration and development of protocols between advocates and child welfare agencies to prevent abusers from using children to punish or coerce their partner. Fast tracking to services in crisis situations. One-off crisis payments from social services or other state programmes to help with clothes and personal items. Reduction of relationship counseling or mediation in cases of domestic abuse. Routine screening for domestic violence in emergency medical centres and hospitals. Make it illegal to commit violence against one's partner. Empower police to arrest abusers based on probable cause, rather than requiring that police witness the violence. Allow for the use of civil orders of protection to provide immediate protection from abuse. Facilitate mandatory arrest of the primary abuser, which takes the burden of arrest off of the victim (Thelen, 2000). The development of sensitive, informed and improved system responses to violence(National Advisory Council on Violence Against Women, et. al., 2009). For example, in response to information discussed at inter-agency meetings, such as the results of institutional tracking of calls to police, shelters may provide inputs and leadership to develop, evaluate and revise policies and protocols for responding to these calls. For example, Mandatory or pro-arrest practices prevent the need for victims to take action to have a violent partner arrested. At the same time, challenges in implementing these laws can result in women being charged due to inaccurate assessment of her involvement (i.e. when acting in self-defence or resisting the abuse). Confusion and resulting arrest of women in these circumstances can place her at greater risk as she will be less able to protect herself and less likely to report violence again. Shelter advocacy with criminal justice system representatives through a coordinated community response can be used to bring these issues and challenges to the surface and plan for improved accuracy of assessments. Standards of individual support and assistance, such as processes and protocols that ensure access to individual advocates for women when they first come into contact with the legal system or other systems (i.e. health). Shelter representatives may educate other service providers and advocate for mandatory referrals to shelter outreach and/or residential services (Thelen, 2000). Increased responsiveness by various institutionalized services, including expanding the availability and accessibility of services in the areas of social welfare, housing, education, employment, medical and legal advocacy, services for non-sheltered women, transitional housing, and follow-up services to sheltered women and their children. Enhanced collaborative relationships and services provided by other direct service providers in the community. Opportunities for cross training among the various sectors involved, which may improve the sensitivity and effectiveness of all providers. Improved services informed by monitoring and tracking responses by shelters, criminal and civil justice, health care, welfare, and other systems, which can be used to report both positive and negative results to the community and other stakeholders (National Advisory Council on Violence Against Women, et. al., 2009).